I’ve not used really thick yarn much before, but this Wool-Ease Thick & Quick is really a treat to work with. I’d be tempted to make up a big project with it if they carried a color I really loved at the Arts and Crafts Store – or it cost less than six dollars a ball. As it is, I only meant to buy two balls (two balls = two pair of slippers) but after the first set, I decided to do something else with the second ball I’d gotten. My second ball was orange, which requires a little explanation. I used to really hate orange – as a color, for clothes, anywhere. As an adult I started really assessing which colors were flattering on me (note to my teenage self: black and charcoal gray = less than optimal) and decided that I was best dressed in autumn colors. That only reinforced my love of green, and I soon came to love brown as well, but I resisted orange until a month or two ago. I really needed some new shirts, and the kind I wanted (at the time) only came in blue, orange, and ivory. Grudgingly, I tried on an orange shirt and behold! It wasn’t awful! It actually looked kind of good! And thus, a whole new color’s worth of potential opened up. So when I found myself with a ball of orange yarn that suddenly had no plan, I decided to make myself something to wear. Pattern is Julia Allen’s Anthropologie-Inspired Capelet. I had to do some serious calculations to resize for my thicker yarn (especially difficult as this was my first top-down raglan) but once I got going it was really, really easy. I started it Saturday night, and I might have finished it on Saturday night, too; but I ran out of yarn! So, I went to the Arts and Crafts store on Monday – and it was closed for inventory. Tuesday morning I was finally able to acquire another skein, and Tuesday night after the kids went to bed, I finished my little project. Sorry the photos are a little blurry; I had Greg take them tonight as twilight was falling because I didn’t want to wait another day to blog about it. 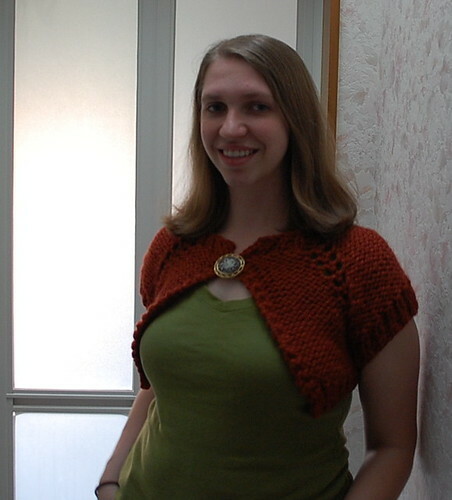 It’s really a cute little shrug: the key to having it flatter is the length. You have to make it so that it falls even with the bottom of your breasts. Too short, and it looks too small, perched atop your shoulders and making the rest of you oversize by comparison. Longer than that and it cuts across your waist, unforgivably thickening your thin parts. In general, I think that’s a good rule to follow for slinging something around your shoulders. I was worried what orange you had there…but that’s a “good” orange. A kind of rusty orange. I made mine pretty long, but with long sleeves too. I love it! I love that. Too cute! You are so creative. So cute!!! Love it, it is very flattering on you.